There sits in the break room on the sixteenth floor of QuiBids’ Oklahoma City office a vital piece of equipment that could — should it malfunction — potentially bring this entire operation to a screeching, ugly halt at any moment. It’s the throbbing heart that pumps the liquid lifeblood through the bodies of this company’s employees. Literally. We’re of course talking about our coffeemaker, without which many of us could not physically perform our daily QuiBids duties. It then follows that, because of this wondrous innovation, you’re able to capitalize on the awesome deals that our site hosts every day, thereby saving money and having fun while shopping. All because of that convenient, fantastic machine. Please excuse me a moment while I go fill up my cup. I’m back. Well, the reason we bring this all up is because we’ve been auctioning off a handful of Hamilton Beach Single Serve Coffee Makers lately, and they’ve proven to be what we in the entertainment auction industry like to call “a slam dunk” for customers. In fact, we even ran the numbers on the last 34 auctions for this $24.99 product, and the resulting statistics suggest that it’s a low-risk, high-reward item that you’re likely to win for a single bid better than a third of the time. Here’s a PDF I used to assemble all the information on these previous coffee maker auctions (it includes the items’ final prices, auction end times, whether or not the auction was a Hybrid Auction, and how many bids the winner spent), and below I’ve made a few observations on the sample. Observation #1: It’s an easy win. 23 of the 34 auctions for the Hamilton Beach Single Serve Coffee Maker cost the winner a single bid. 23 of 34. QuiBids users are winning these $24.99 items for a single bid better than 67% of the time. Please excuse us while we go do this. Observation #2: Just because it’s a Hybrid Auction, doesn’t mean you should avoid it. 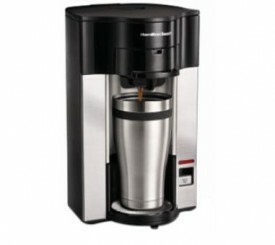 Of the 34 auctions for the Hamilton Beach Coffee Maker, seven included a 1X Gameplay and one came with 20 Voucher Bids. Half of these eight Hybrid Auctions were won with three or fewer bids, and none of them exceeded 24 cents in the final auction price. So go after those Hybrid Auctions, people! The amount they’re worth doesn’t deteriorate your likelihood of winning enough to justify just watching other bidders take them down! Observation #3: Even when the auctions do get heated, users still save money. Even with the three most expensive auctions for these babies, the winner saved an average of $16 toward a $24.99 item, just shy of a 66% discount. And if you find yourself locked into an auction that escalates out of control, we might remind you of the ever-present Buy Now feature! We’ve got four more auctions for these Hamilton Beach Coffee Makers scheduled to end in the next several hours, so you should add them to your Watchlist and apply this newfound knowledge to your strategy! Let us know how it goes in the comments below. Happy bidding!